This article was originally published on Feb 20, 2014 but contains seasonally relevant information. Like every other living thing our bees have the ability to make more bees. But instead of allowing our colonies to multiply many beekeepers spend hundreds of dollars to buy bees to replace the 1/3 of our colonies which we KNOW from statistics are going to die every year. Making increase will be the subject of discussion at the May 3, 2018, meeting of the Cookeville Beekeepers Association. This article was originally published on Feb 20, 2014, but contains seasonally relevant information. Like every other living thing, honey bees have the ability to make more bees. But instead of assisting our colonies to multiply, many beekeepers spend hundreds of dollars to buy bees to replace the 1/3 of our colonies which we KNOW from statistics are likely to die every year. Every beekeeper should know the basic skill of how to make increase by splitting hives. Not only should we know how, but we need to be routinely doing it every year. No beekeeper should be routinely buying bees every spring. Maybe you have tried splitting before and for some reason, the results were discouraging – splitting does fail about a third of the time more or less. I was fortunate in that when I split my first hive during my first year keeping bees it did work out. That positive experience encouraged me to continue to make increase every year, and for me, it has become one of the most rewarding things that I do as a beekeeper. I would like to encourage others to try making their own increase – or try it again – so that you can also enjoy this aspect of beekeeping. And so you can stop buying bees. As you know the queen is the key component to a honey bee colony. 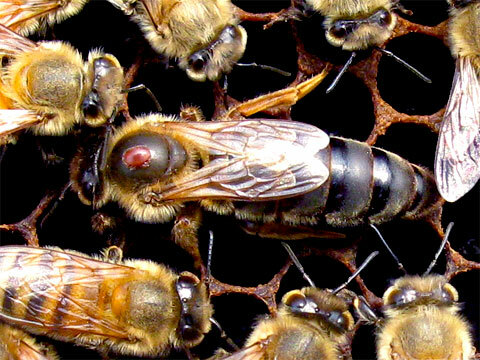 A good queen and a few workers can soon grow into a productive hive. Splitting is the simple way of producing queens and new hives. During the beekeeping season any queenless colony will try to produce a queen – So all we have to do is arrange a queenless colony and make sure that it has what it needs to make a high-quality queen – and then let the bees do the rest. During the reproductive season the required resources to make a new queen are – eggs or very young larva, food, and plenty of bees to care for the developing queen, and drones for her to mate with. * That’s it. The reason that it is possible for a hive to produce a new queen is that the only difference between a queen and a worker bee is the diet provided by the nurse bees during the first 5 days of its life. Think about that for a moment – any of the thousands of female worker eggs that a queen bee lays can become a queen instead of a worker if it is fed queen food – royal jelly – for 5 days. However, it takes hundreds of well-fed nurse bees working together to properly feed each developing queen and form a good queen cell. At this time there are plenty of drones available to mate with new queens. Weather is usually settled – not too hot or cold. Moderate weather is better for mating and less stressful on hives. Also at this time of year there is more nectar and pollen available in our area than at any other – so developing queens can get the best possible nutrition, and new hives can more easily feed their selves. But, hives can be split any time there are drones available. When is it Too Late to split and make a new queen? Technically a queenless colony will be able to make a new queen any time that there are drones available for mating – so you might be able to split in late September. But this is not at all recommended for several reasons – it is certainly working against nature, and will be much harder to pull off successfully. Most queen producers sell their last batch of queens in early September – or sooner. Personally, I would say that August 1st is the practical deadline for starting the process of producing a queen. And actually, such late summer queens which start laying in earnest around Sept 1 are often outstanding performers and produce tons of brood for the critical fall build up. In general though, sooner is better than later. The simplest way to split a hive of bees is to just divide all of the frames from one hive between two hive setups with each getting half of the brood, bees, and food – and then just hope for the best. One hive will have the old queen, and one will make a new queen – you really don’t even have to know which is which at the time. With a little bit of luck and if the hive was pretty strong, to begin with, that is all you have to do. One month after making the split – if all goes as planned – which it does 60-75% of the time – you should be able to find fresh brood in the hive which made a new queen. With a big strong hive, you really can just do that – a blind walk away split – and it will work just fine. However, if you are not starting with a great big, densely populated double deep hive there are several things that you can do to improve the chances that you will end up with a good hive and a quality queen anyway. One thing that you can do is buy a queen from a reputable producer and put it into the queenless half of the split. Furnishing a queen improves the chances of success by quite a lot, and allows both hives to start building up right away. A split with an already-laying queen doesn’t have to be particularly big or strong to be viable. If you don’t furnish a store bought queen then you will be mostly concerned with making sure that the queenless split has a strong population of well-fed nurse bees. It takes hundreds of bees to feed a larva and produce a good queen cell, and the more densely populated a hive is, the better the results will be. You can make sure that the queenless half of the split has lots of nurse bees in it by shaking them off of brood frames from the queenright half of the split – or from other hives. Just make sure you don’t accidentally move a queen while you are at it. You can also put the queenless half of the split in the old location so that it will retain almost all of the foragers – which will help to ensure that there will be plenty of fresh nectar and pollen available. Or you can even split the old queen out into a small nucleus hive with just a frame or two of bees and brood – leaving the queenless half as strong as possible. If you find queen cells during an inspection you can very gently move the frame it is on + a frame of food stores – along with the clinging bees + an extra shake of nurse bees off of another brood frame to form a nucleus hive. This is almost exactly what queen producers call a “mating nuc” and depending on the time of year and weather conditions it can grow into a fully self-sufficient colony before winter. Other than the blind walk away split which was mentioned first – all of those things require you to know which hive has the queen in it. I don’t know about you – some people are very good at finding queens – but for me, it can be a very time-consuming, frustrating process. If I’m not actually looking for queens I often see them casually walking around – but it never fails that if I really need to find her – she is nowhere in sight. How to split a beehive without having to find the queen. Nurse bees are very attracted to open brood – so you can use open brood to lure nurse bees through a queen excluder and separate them from the queen. Move the hive you are working on to a new location a few feet away in the yard – as you move it stack the boxes in reverse order. Put an empty nuc or hive setup in the original location – Almost all of the foragers will leave the hive you are working on and go to the original location even if the hive in that spot looks different. This will allow you to do the rest of the manipulations without having to deal with so many bees. If the hive you are working with is pretty populous you should temporarily put an empty hive body on the bottom board to make room for all of the bees you are about to shake down. …to this. Now you can easily make sure that the Queen is not on this frame. If your goal is to split the queen out into a nuc then go ahead and arrange the resources you want to use to make up her nuc in the bottom box – a frame or three of mostly capped brood, a good frame of honey and pollen stores, some empty comb for the queen to lay in, and a frame of foundation to give them some room to expand. But little if any open brood. Shake/brush all or almost all of the bees off of most of the frames of open brood and into the bottom box(es) one frame at a time and then look hard at them for a moment to make sure that the one bee still clinging to it is not the queen – then put those beeless open brood frames in a spare empty box. If at any point you happen to spot the queen you can stop shaking bees. Put the frame with the queen on it and another frame of bees to keep it company into an empty nuc or hive setup. Finish sorting the frames and put pretty much all of the open brood into the one box. Now you know that the queen is not in the box of open brood, because there are very few bees in there at all, and you made sure that none of the few bees that there are is the queen. This whole process might take 15 minutes. If your goal is to make a new hive with a purchased queen then you should also put some frames of capped brood and some stores in the beeless box along with the open brood frames – these are the frames that you want to use to start a new hive. Of course, shake the bees off of them too. By the time you finish shaking all of the bees down there might be a lot of them outside of the hive – but don’t worry – even if one of them is the queen she will crawl back in through the entrance along with everyone else. And if by chance she doesn’t she will almost certainly be surrounded by a mass of workers that will be easy to spot. Use empty frames of foundation or empty comb to fill up any partial boxes. Now you will have one box sitting on the bottom board with a few frames in it – very little if any open brood, and almost all of the bees. Most importantly the queen will be somewhere in there. Chances are there will be so many bees that they will be hanging all over the outside as well as crammed inside – but that’s ok it will all work out. Go ahead and place your queen excluder on top of that box full of bees. Use smoke or a brush or whatever you need to accomplish this without squishing a bunch of bees – one of them is your queen so try to be gentle. You will also now have at least one box with most of the open brood, and you might have other boxes with empty comb, honey, pollen etc. But other than a few curious foragers or robbers there won’t be all that many bees in these boxes. Stack all of them above the excluder with the box of brood on top. Come back in an hour or so. When you come back that box of open brood on top of the stack will be full of mostly nurse bees, but the queen will still be below the excluder in the bottom box, and all of the foragers will be in the nuc that you left in the original location. If are splitting the queen out into her own nucleus hive all you have to do is remove the bottom box and place it on a new bottom board in a new location in the yard. Most of the foragers will have returned to the original location, and the queenright hive might need to be fortified with a frame or two of brood and/or some shaken off nurse bees from the strong queenless box. Feed both halves for at least a week or so after splitting – this will go a long way to reduce stress. Make a note of the date – in one month you should be able to find brood from the new queen. But until then leave them alone as much as possible. It sounds like I will have to spend a lot of money on Woodenware… You can of course, but you don’t have to. Any hive body can become a complete hive setup by setting it on top of a flat piece of wood (or hardware cloth) and using another one as a cover while leaving a crack for the bees to go in and out – it might not be pretty but it will work just fine. You can also build a simple nucleus hive for less than $15. So This is really no excuse. What if you end up with more Colonies than you want? – Having extra colonies gives you the opportunity to cull/combine some that are under-performing. Two or more small colonies can be combined in the spring to make a big strong honey production hive. If you still have more than you want or need you can always sell bees – especially during spring. Not interested in making money? Then give them away. In reality, dealing with too many hives is not as much of a problem as it sounds like it might be. To produce nucleus hives for fun and profit. Honey hives are work, but nucleus hives are fun. Locally produced nucleus hive can be easily sold – especially in the Spring. To produce extra/spare queens or even routine replacement queens. You will never regret having a spare queen. For optimum honey production hives should be requeened in mid/late summer. The best chance of splitting successfully is just before and during the main flow – mid-April through early June in our area. After that, it is still possible but gets steadily more difficult. When a hive is split it is preferable that the half which will be producing queen cells has lots of bees – even if the other half which already has a queen does not. The developing queen inside of a capped cell is extremely fragile until the cell has been capped for about 4-5 days – avoid disturbing them at this time if at all possible. If you must, then be very gentle. If you find a nice queen cell during an inspection then you no longer have to worry about needing lots of nurse bees to raise your queen – the bees already took care of it for you – the developing queen inside the cell has already been well fed. All you need to do is be careful with it and set it up in a new hive with enough resources to get started. Making a new queen cell requires a relatively strong (not necessarily big) hive with plenty of well-fed nurse bees, eggs or very young brood, and drones for the virgin queen to mate with once she is mature. The earliest time to split and begin making a queen is when you see capped drone brood (at the purple eye stage of development) in your hives – which indicates that by the time the new queen is ready to mate mature drones from other hives will be available. If instead of a laying queen you can furnish the new hive with a queen cell – which you have found during an inspection – then the split doesn’t have to be particularly strong, nor does it absolutely require young brood, but drones must still be available for the new queen to mate with when she emerges. A queen cell takes 5-11 days off of the process depending on the age of the cell. When you make a queenless split (or a hive becomes queenless for any reason) you should be able to easily spot brood from the new queen in one month – mark the date on the hive. If after a month a thorough inspection fails to reveal any brood then the new queen probably got eaten by a bird or lost on the way back from mating. Before small hive beetles arrived in our area you could have possibly tried again by just adding a frame of fresh brood, but now such a long-term queenless hive would probably succumb to SHB long before a new queen could be brought up to lay. So if a hive is still queenless after a month you should either give it a new laying queen right away or shake it out (50 feet or so away) to prevent laying worker problems. Redistribute the frame resources to other hives after freezing them for a couple of days to kill any SHB or eggs – there will be very little if any brood remaining in the hive by then, and practically no nurse bees – they will have become foragers already. If you remove the hive equipment from its spot completely the forager bees will peacefully join other hives. Nothing will have been wasted. If you want to try again to make a new queen then on the same day you shake out the old nuc you can make up a new nuc from fresh brood and resources from another hive (along with clinging bees) and put it in the same spot as the one you shook out. The foragers from the hive you shook out will move right in and make it quite strong right away. Then you can safely let it try again to make another queen without risk of SHB or laying worker. Laying workers are not oriented to their hive – so when you shake them out they can’t find their way back home. You don’t really have to worry too much about finding the queen when you make up the new hive, because if you move the queen from another hive by accident then her old hive will now be queenless and will make a new queen. You can make a queen right split just about any time during the season as long as both hives will still have enough bees to be viable – although it will work best if the hive you are splitting already has a good amount of brood, and a good population of bees. Caution! – if a hive already contains swarm cells when you split either or both halves may still swarm if you don’t remove the swarm cells. If you are not using a purchased queen then you can leave some queen cells on one frame of the queenless half of the split, but you need to remove all of the cells from the queenright half. Removing the queen from a swarmy hive may not keep it from swarming no matter what you might have heard. A big strong hive that contains many swarm cells will probably issue several swarms with virgin queens even if you remove the old queen. You need to knock down most of the queen cells to prevent this. If you split and one of the splits tries to swarm then it probably already had a cell started – or was just too strong. Usually splitting puts them in expansion mode and they build up and draw comb instead of trying to swarm right away. Unless the split already contains swarm cells. I’m repeating myself – I guess it should be clear that you don’t want a queen right split to have swarm cells in it. You also don’t want a queenless split to have too many swarm cells or for the cells, it has to be widely separated inside the hive. Either condition can result in multiple virgin swarms – but that is more likely to be a problem in bigger stronger hives than in a nuc. If you split colonies which already contain swarm cells either or both halves of the split can still swarm – you need to remove all swarm cells from queenright colonies and all but a few cells on a single frame in queenless splits. This is a very “strong” hive. *Strong hives do not have to be big hives… When beekeepers say strong hives they mean that it has a dense population of bees. A 3 frame nuc with a lot of bees can be considered strong – while the same number of bees in a double deep hive would be very weak. **What about drones? Don’t worry about them. Unless you get serious about rearing queens there will be plenty of drones available during the beekeeping season to mate with your queens.